Han Bennink, drums, various percussion, cymbals, bass clarinet, fiddle, whistle, toys; Misha Mengelberg, piano; Paul Rutherford, trombone, euphonium; Mario Schiano, alto saxophone. 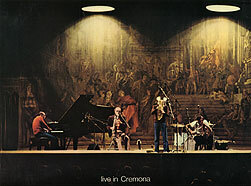 Recorded on 24 April 1978 at Teatro Ponchielli, Cremona. Cover photograph (reproduced above) by Art Photo - Cremona.